The North Carolina Executive Mansion sits northeast of the hustle of downtown Raleigh in Burke Square, one of five green spaces included in the capital city’s original plans. Drawn up by William Christmas, the surveyor envisioned a city landscape much like Savannah, Georgia, that included multi-acre public plots dotted throughout the city for residents to enjoy nature. Since then, Union Square became the state’s capitol building, Cashwell Square became the School for the Deaf and Blind and Burke Square became home to the governor at the insistence of Gov. Thomas Jordan Jarvis in 1883. This lesson in state history is one of the first things we receive upon entering the mansion from their tour guides. However, on an unseasonably warm morning in May, North Carolina’s First Lady Kristin Cooper is the tour guide revealing the history of her new home. And she’s a bold, fun tour guide. On the way in, she jumps onto the rope swing hanging from the large magnolia tree out front, much to her chief of staff’s chagrin. Standing on the low swing in her wedges, throwing her whole self into building momentum, she laughs. “Honey, I can do whatever I want,” she yells, but looks over at the State Trooper keeping an eye on the group and quickly returns to solid ground. She’s a blend of the proper Southern hostess and a rebel. She offers refreshments to her guests, but not before ushering us through a door to a closed-off, official-looking area that houses the kitchen and security offices. Half-sweet, half-unsweet tea in hand, she continues rattling off facts about the massive home and pointing out details in the front parlors. She shares the upper floors with her husband, Gov. Roy Cooper, two cats and until the night before, their dog Chloe. In the Gentlemen’s Parlor, which is a striking contrast to the Ladies’ Parlor across the foyer, she points out the rug. It honors the history of North Carolina with depictions of the state’s pivotal moments in each of its corners. There’s Desoto from his 1540 exploration of the Appalachians in the far left corner, the beloved Old Well from the opening of the state’s first public university in 1795 to the right, the Wright brothers’ biplane in the far right corner, and the ship sent by Sir Walter Raleigh himself to establish the first colony on Roanoke Island to the left. She says she’s grateful for the snow in January because that gave her time to dig up old notes about the home and learn its history. And she continues with the tour as if we came to see the house and not her, pausing briefly in the gilded ballroom. “The school groups always love this room because it’s covered in gold,” she says in a way that sounds like she didn’t quite buy into the extravagance of the decorator who refashioned the home in the 1970s — the same designer Jacqueline Kennedy used during her stay in the White House. And it’s true. Kristin Cooper is not extravagant. She’s a mother, a wife, a friend and a lawyer. She has hopes and dreams. She suffers through loss and disappointments. She climbs trees and plants herbs in her yard. She works hard and likes to have fun. To put it simply, she is normal. And in today’s tumultuous political landscape, being normal is refreshing. Born to a physician and an artist, Cooper grew up in Oklahoma City with her three sisters. After earning her undergraduate degree from the University of Oklahoma, she enrolled in law school because it was the one thing that blended her interests of history, writing and reading together that didn’t require her to become a professor. After graduating Campbell Law School in 1982 with her Juris Doctor, she worked as a staff attorney for the legislature in North Carolina. That’s how she met her husband, a legislator from Nash County who would go on to become the state’s 75th governor. The role of First Lady at any political level is a strange one. There is no job description or hiring process. The only way to apply for it is by showing unwavering support of a significant other. The only how-to guide available is the example others have left in their wake. Ferrel Guillory, a political analyst and director of UNC-Chapel Hill’s Program on Public Life, puts it simply as a role without a script. “North Carolinians, in general, like their governors to put on a blue suit and a tie and get to work,” he said. “That’s the way [Roy Cooper] is. But Kristin Cooper is doing more than standing by her man. Cooper stepped back from the courtroom years ago to focus her attention on raising their three daughters, and there hasn’t been a true administrative Office of the First Lady of North Carolina in years. So she’s embracing the unique opportunity to create a new standard in her time at the mansion. Childhood hunger. Literacy. Foster care. The arts. Child abuse and neglect. This is what she wants to advocate for in her new position. She wants to bring to light how these difficult issues are connected and affect the social and emotional health of children in North Carolina. And she’s hitting the ground running. In May, she partnered with the Food Bank of Central and Eastern North Carolina to kick off “Stop Summer Hunger,” a program designed to prevent nearly 300,000 students from going hungry while school is out for the summer. She also spoke to the graduating class at St. Mary’s in Raleigh, where her eldest daughter completed high school in 2011. “This troubled world needs your light, your voice, your spirit,” she said to the 77 young women graduating that day. Urging them to resist the trappings of comparison in today’s social media-driven world, she joked that even she wanted the life she portrayed on social media. In June, she visited the Chapel Hill Public Library to announce a federal grant totaling $120,000. To say she’s keeping busy is an understatement. While most of her appearances fall in line with her husband’s political stances, she genuinely cares about the issues at hand. For instance, her dedication to North Carolina’s Guardian ad Litem program spans over a decade — using her law degree to advocate for at-risk foster children in the court system, so they don’t become abandoned or neglected. As she walks through the gardens at the Governor’s Mansion, she talks with passion about how farm-to-table restaurants impact health and the economy and how important it is to provide healthy meals to those in need. Back inside the mansion, she sits down in the naturally-lit Morning Room and shares her love for reading and memories of reading books like Four on the Shore and Dr. Seuss’s classics with her girls as they grew up. The memories of her daughters asking her to read with them is why reducing illiteracy in young children is so important to her. She says a study from the University of Chicago recently stated that poor children enter school having heard 30 million fewer words than children in middle to upper-class homes. Reach Out and Read partners with doctors to “prescribe” books to encourage families to read together and educate parents on the developmental importance of reading aloud. This is something the Cooper family incorporated with their own children 20 years ago. The impact was brought to attention as recently as this past Mother’s Day when her daughter Natalie mentioned reading aloud every night. Two pages for her mom and one page for her. Along with reading comes a passion for the arts for the Coopers. Her daughters have joined her on the stage of community theaters in North Carolina in productions of “Camelot” and “The Diary of Anne Frank.” Kristin also spends hours behind the scenes making costumes and serving on the Board of Directors at the Raleigh Little Theatre. On the way out of the mansion, she stops in the threshold of the dining room. Some staff members are just sitting down to eat lunch, checking their phones and planning a joint baby shower for three troopers who will be fathers soon. Pointing out the impressive crystal chandelier, she says it was delivered in a nondescript box unassembled with no instructions in the 1950s. It was a gift from the Horowitz family who fled Nazi Germany in World War II and landed in Asheville, North Carolina. According to the house notes, the chandelier was one of the few family heirlooms the Horowitz’s were able to recover after the war. They gifted it to the state for its kindness to them as refugees. She pauses. Her story is not a political statement on immigration, but more of a comment on doing the right thing. At the end of the day, that’s who Kristin Cooper is. She’s a mother, a wife and a friend who focuses on doing the right thing. Details Matter | Kristin Cooper is all about the little details. When she attended an event at NC State earlier this year, she wore red. When she walked in for our interview, she had on an orange sweater with a tiny wooden camel pinned to the collar. One Stitch at a Time | The aforementioned sweater wasn’t just any orange sweater, either. When I mentioned it, she said she couldn’t find the right color orange, so she made one herself. An avid knitter, she hosts a regular knitting circle for her friends and even held an event for World Wide Knit in Public Day on June 10. 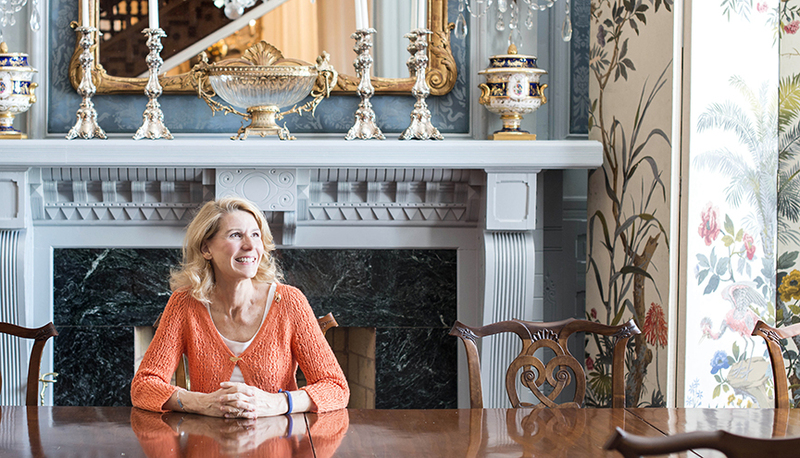 Experiences Over Things | The first-floor library in the Executive Mansion is the one room, besides the dining room, that is often used by the First Family and staff who work there. It’s a manly room with dark woodwork and rich, warm leather furniture. Among all the grandeur are Cooper family photos in simple black frames. Photos of pets, family adventures, and the Cooper women at the Governor’s Inauguration Ball. Signaling that a fancy frame doesn’t compare to what’s inside it. First Pets of North Carolina | The First Family’s pets joined Facebook earlier this year. Adelaide and Alexei rule the roost as most cats do, but the pets of the Cooper daughters make appearances too. First Dog Ben belongs to Hillary and likes to photobomb family photo sessions, and Natalie cares for an orchid mantis named Daisy. Fitness Protection Program | She’s dedicated to her Fitbit. While she can’t ditch her security detail, she hits her daily 10,000 step goal by donning a disguise and going for a walk around town. Ninety percent of the time no one recognizes her. Fish and Feathers | After our tour through the gardens, she walked over to the koi fish pond and greeted them as friends. Noting that they used to have six fish but a hawk snatched one. An added benefit of top-notch security, knowing what happens to the koi fish. By Any Other Name | The grounds crew at the mansion insisted on planting two types of roses this spring when they were working on updating the landscape: the Oklahoma rose, an homage to Kristin’s home state, and the Kristin rose. First Lady Kristin Cooper at the Executive Mansion in Raleigh. This huge dining room is her favorite room in the house.